The announcement was made by Bob Allen, vice president of Disney Production Services Inc.
"Donna's Day,'' features columnist and award-winning author Donna Erickson, the nationally recognized expert on parenting. In each episode, Erickson uses innovative, easy-to-do and entertaining activities, recipes and strategies to strengthen relationships and communications between adults and children and to build family traditions. 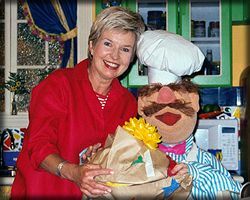 "Donna's Day'' is being produced for cable by Jim Henson Television. Erickson is host and creator. Hugh Martin ("Mr. Rogers' Neighborhood'') is executive producer and director. Production on "Donna's Day'' begins Aug. 25, 1999. "All of us at the Jim Henson Co. are delighted that we are producing this wonderful show at Disney-MGM studios,'' said Rod Perth, president, Jim Henson Television Group Worldwide. The Jim Henson Company, an established leader in family entertainment for more than 40 years, is an independent multimedia production company; one of the top licensors in the industry; a leading publisher of children's books; and home to Jim Henson Television, Jim Henson Pictures, Jim Henson Interactive and Jim Henson's Creature Shop (TM). The company has headquarters in Los Angeles with offices and production facilities in New York and London. The Jim Henson Company's Web site is located at www.henson.com. Disney-MGM Studios is comprised of multiple sound stages, a unique Studio Backlot, and state of the art post-production facilities, including cutting-edge sound design capabilities, making it a convenient one-stop-shopping mall for all aspects of production. Located near Orlando, Disney-MGM Studios and Disney i.d.e.a.s. is an ideal spot for East Coast productions.